My name is Daniele Paolo Scarpazza and this is my personal website. I was born and raised in Italy, but I have been living in the United States since mid 2006. For my english-speaking friends, my name is pronounced dun/yay/lay scar/pot/tsa, but please just call me Daniel or Dan if it's easier for you. I work at D. E. Shaw Research in New York City, where I write software for the Anton supercomputer. Formerly, I was a research staff member at the IBM T. J. Watson Research Center in Yorktown Heights, where you can still access my publications page. I love kayaking. Please read about the most adventurous of my kayaking trips across the Cape Cod bay. My e-mail is scarpaz@scarpaz.com. My Google buzz is here. The above document was last modified on 2010-07-02 22:00:15; page last updated on 2010-10-05 at 23:12:38. Document size: 1225 bytes, plus related data up to 2.17 Mbytes. My slide rule collection. La mia collezione di regoli calcolatori. Un compendio di grammatica Esperanto e link utili. The 3not2 problem is a very puzzling logic problem. Portions of this website which are outdated, or very old. A couple trips among the seals around Monomoy Island and Pleasant Bay (Massachusetts). The second 2010 (August) circumnavigation of Manhattan. My solo kayaking trip across the Cape Cod bay. My first kayaking trip in 2010 was 17 miles, across the Long Island Sound. The 2009 Kayaking Circumnavigation of Manhattan. Kayaking trip to Barnegat Bay, NJ, End of May 2009. Kayaking trip to the Upper Delaware River (NY, PA), late April 2009. Visit to the Intrepid Sea, Air and Space Museum, NY city, November 2008. A hiking and climbing trip to New Hampshire, August 2008. A memorable kayak trip from Manhattan to Liberty Island, August 2008. ... back to downtown Chicago, for a conference. Wonderful underwater shots of a few dives I did in Ischia, Italy, in May 2008. Driving across upstate NY, to Niagara Falls. / È venuto a trovarmi il Pizza, e siamo andati a vedere le cascate del Niagara. Some random photos of the Keys; snorkeling in Key West, April 2008. Miami beach; scuba diving in Miami, April 2008. Some of my favourite shots of New York. Some shots underwater life from Kauai, November 2007. Some amazing shots of marine life, taken during my advanced scuba checkout dive in July 2007. 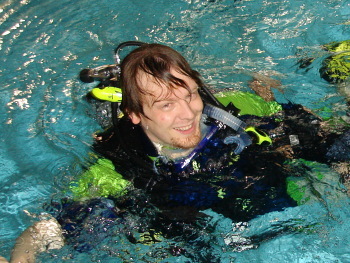 Shots from my scuba diving checkout session at the Puget Sound, Washington State, in June 2007. Some shots from a scuba diving pool session in Kennewick. Another rafting trip on the White Salmon River with my visiting friends. A weekend at the White Pass ski resort, Washington State. A crazy rafting trip on the Tieton River (close to Naches, WA), a sunny sunday of September 2006. The first time I went rafting. A weekend in Portland, plus a visit to the Bonneville Dam. Summer 2006. My farewell party in Leuven, a few days before I left Belgium, in the spring of 2006. Lo Scarpaz che prende congedo dal Cetriol, Novembre 2005. Scampagnata abusiva al Monte Pellizzone. Il sommergibile Toti in marcia dal porto di Cremona al museo della scienza e della tecnica di Milano. / Submarine Toti in his way from Cremona harbor to the Science and Technology Museum in Milan. Traversata del lago Maggiore da Stresa a Reno di Leggiuno, 17 luglio 2005. Qualche foto dalla traversata del lago di Mergozzo, 17 luglio 2005. Qualche foto dalla traversata del lago di Como, Onno-Mandello, 10 luglio 2005. Milano, se uno non la conosce, non sa cos'è. My birthday party in Imec, 2004-10-08. Tourism in Belgium - trip to the Antwerp - viaggio ad Anversa. Il mitico fine-settimana della birra a Bruxelles. Da vedere. Tourism in Belgium - trip to the historical city of Gent. Le prime fotografie di Brussels, quando sono arrivato in Belgio 2004-06-26. Le foto del mio viaggio a Edimburgo dell'estate 2004. Fotografie scattate il giorno della laurea al Polimi. In un documento del 19 Agosto 1793 si parla per la prima volta dell'organo della chiesa parrocchiale di Madignano. Some photos taken during my first stay in Chicago, in 2000. A free anti-spam filter written in Tcl. MajaMaja is a free, extremely simple web content manager written in Tcl. This page was last updated on 2010-10-05 at 23:12:46. This site was automagically generated by MajaMaja version 0.298, a simple and easy to use web content manager written in Tcl by scarpaz <scarpaz@scarpaz.com>.